This layered ball gown wedding dress from Stella York is a princess bride’s dream come true! Layers of frothy tulle create volume through asymmetrical horsehair hemlines. 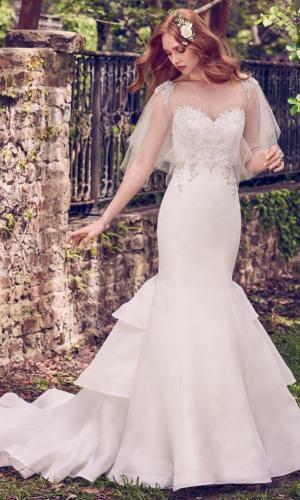 A lace covered bodice with a strapless sweetheart neckline is reminiscent of traditional ball gowns but this wedding gown is given an update with a Diamante belt that shimmers at the waist. An easy-close zipper is hidden under fabric buttons for the perfect fit.